Join our Nepal trek and see first-hand the impact of CARE's emergency work after the earthquakes. Since 2000, we have worked in Nepal in partnership with local organisations, networks, federations and community groups to address the underlying causes of poverty, conflict and social injustice. These include discrimination, poor governance and vulnerability. We place special emphasis on involving women, Dalits and other poor, vulnerable and socially excluded groups in local development processes. All our projects integrate rights, equity and participation. We advocate for marginalised people to have access to basic services and resources so they can secure their livelihoods, and are involved with a number of networks to prevent sexual and gender-based violence. Nepal is prone to natural disasters, so we raise public awareness on disaster preparedness and work with communities to develop contingency plans and reduce their risks. We also help them form first aid and rescue committees. CARE is supporting a grassroots movement of equitable natural resource management through civil society groups in order to ensure that natural resources are managed in a democratic and sustainable way, and that the benefits and other earned revenues are equitably distributed to the local communities. The 2006 peace accord brought hope for a more stable future, ending a decade of armed conflict. We work with national and local networks to observe the UN Security Council Resolution on Women, Peace and Security, which addresses the impact conflict has on women, as well as women’s contribution to conflict resolution. We work with communities to develop Peace Promotion Centres, Women’s Advocacy Forums, Open Village Schools and other groups, helping them improve social harmony and resolve disputes through community mediation. 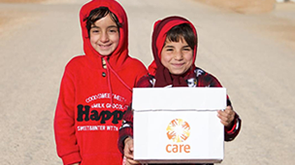 CARE works to increase access to health services, encourage people to seek timely and appropriate medical care and build the capabilities of local health services. We train community health workers to promote childhood immunisation, educate women on breastfeeding, and promote better hygiene. CARE coordinates with national networks and the government to raise awareness about HIV and provide information in rural communities, and support hospitals to establish voluntary counselling and testing centres. CARE provides literacy programmes for adults and out-of-school young people, many of them women. We provide scholarships to poor and socially excluded children and work to improve school buildings and facilities. Ishwori Rana describes how CARE has helped her family following the floods in Nepal.